The following instruction applies only to version 3.3. Other versions are no longer supported. Step 1: Download Mental Omega 3.3 files. Step 2: Prepare files from Red Alert 2 Yuri's Revenge 1.001. To clear things up at start, Mental Omega 3.3 is NOT standalone. While Tiberian Dawn, Red Alert and Tiberian Sun are now freeware, Red Alert 2 and its expansion are not and you can still buy it as a part of The First Decade or The Ultimate Collection compilation packs released by Electronic Arts. This means in order to play Mental Omega 3.3, you require files from Command & Conquer Red Alert 2 and its expansion, Yuri's Revenge, the latter of which must be patched to version 1.001 for Ares to work properly. While it was possible to use the XWIS multiplayer version with 3.0, that release will not work with 3.3. Now, you can either create an empty directory and copy the following files from Red Alert 2 Yuri's Revenge to it, and then extract Mental Omega 3.3 files there, or you can just extract Mental Omega 3.3 archive to where your Red Alert 2 Yuri's Revenge is, as it won't affect the original game. However, DO NOT do the latter if you are playing Yuri's Revenge on CnCNet, as the files are incompatible and will overwrite each other. The mod itself does not overwrite original game's files. Step 3: Extract Mental Omega 3.3 files. After you've prepared your directory with Red Alert 2 Yuri's Revenge 1.001 files, extract Mental Omega 3.3 files to it. The mod doesn't overwrite any of the original game's files but I'd recommend creating a new directory to put Mental Omega 3.3 into, as it will be easier to remove it if you want to. Mental Omega 3.3 includes Ares DLL but does not include the soundtrack. Download it separately and extract to where you've installed Mental Omega 3.3 to. Step 4: Start the Mental Omega Client. The special new client created by Rampastring of Dawn of the Tiberium Age fame allows us to use the latest version of CnCNet for free multiplayer services, as well as many functions that were not possible with the standard Red Alert 2 interface. It also allows you to easily update the mod. 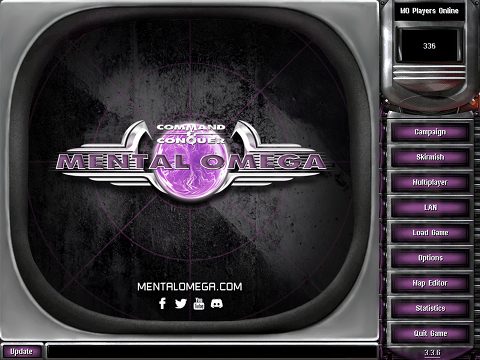 Step 5: Download the latest Mental Omega 3.3 updates. Using the client you can check for and download the latest updates for the mod. The client will do that automatically by default, but in case it doesn't or if you turned off the automatic updates, click on the bottom-left area of the main menu to check for the updates. You can also download the new files manually from here and extract them to where your Mental Omega 3.3 is located. Overwrite all of the old files there. If you encounter any issues or need further help, head to the Mental Omega forums. If you're having problems with the new client, write a Private Message to Rampastring.